Melissa & Doug Grocery Store/Lemonade Stand Giveaway at Go Graham Go! 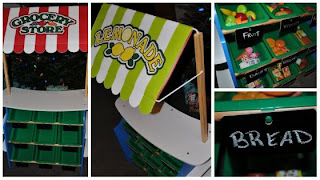 If you have small children or even tweens, they love the idea of playing grocery store or having a lemonade stand. Go Graham Go! has a great giveaway for a Melissa & Doug stand. I can see this toy also being a valuable educational tool. Use the bins to separate foods by color and label the chalkboard accordingly. You could even start practicing food groups. If you have a cash register, this could be a fun way to introduce making change and counting money. If it's a sunny day, why not open up an actual Lemonade Stand and put your child's math and social skills to work in real life? The Grocery Store/Lemonade Stand is perfect for children ages 3 and up and does not include food. Melissa and Doug have some adorable play food you can purchase for about $19.99 to go along with this. You can purchase the Grocery Store/Lemonade Stand for about $129.99 online or at a retailer near you. Go HERE to enter as it ends today!